@ Lighting equipment is installed with 120pcs LED.We use EDISON LED chip as default LED chip . @ Low power consumption,super lumlnance,rich and splendid color. @ The average service life of every LED reach 100000 hours. @ DMX- 512 control signal , 11 standard channels. @ Wide range super micro smoothly scanning,horizontal scanning angle reaches 540° and vertical 225°,the scanning precision reaches 8bit and 16bit,with smooth and preclse positioning,additionally,the scaning spead is adjustable. @ Infinite RGB color system. @ It adopt the LCD display,as its operating in terface,the words can also be plus or reverse setted by 180°,very easy for using on the floor or hang on. @ With inner automatic run fanction ,master/slave setting very easy to operate by users . @ The fixture’s out shape adopt pressed consruction design and trong wind refrigeration system which be know as a good cooling system. 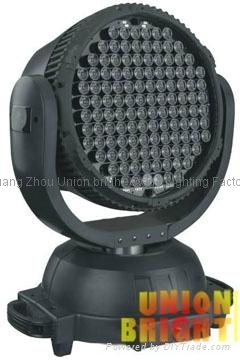 Copyright (c) 2009-2012 Union Bright Stage Lighting Co.Ltd,All rights reserved.